Key to every spot they fished were the presence of shell beds in 5 feet of water. “We held our boats between 6-7 feet of water, and cast up on them.” The 19.66 pound limit is the heaviest in Classic history, and also tenth heaviest in R & B History. It was anchored with the Native Pride Tackle Big Bass - a 4.70 pound smallmouth. 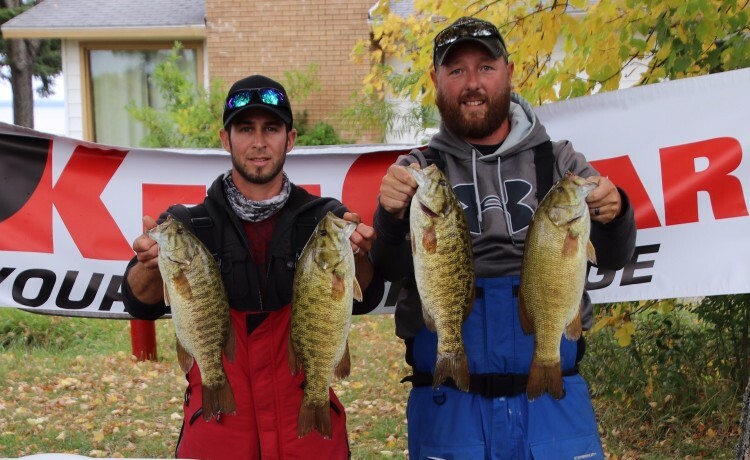 How it Happened: It took just an hour to boat a limit of smallmouth, but it was an important improvisation that got them on track, “We lost our first four fish on tubes with a ⅜ ounce weight on a spinning rod,” Wagner said. 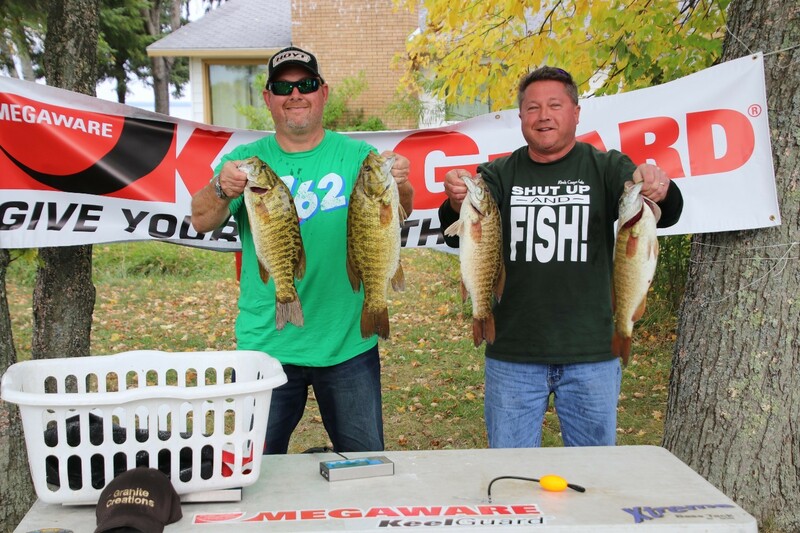 Houghton Lake did not disappoint for the 2017 Megaware KeelGuard R & B Bass Circuit Classic. Of the 40 teams participating, 23 caught limits, and more than 40 fish exceeding 3 pounds were brought to the scales. And this occurred in what was considered a tough bite for Houghton standards! Over $10,000 was given away over the weekend and over $1,000 in prizes Friday Night. In all, over $37,000 was given away during 2017. On both Thursday and Friday they searched for new areas, but also revisited their 5 spots to confirm the fish stayed - they did. 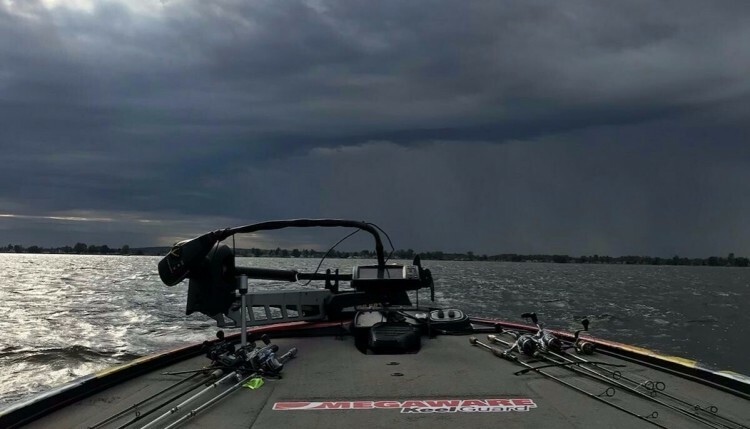 “We took the hooks off our crankbaits just to double, triple, and quadruple check they were still there,” Price said. Friday was spent confirming the population of fish there, but also searching for more productive spots. 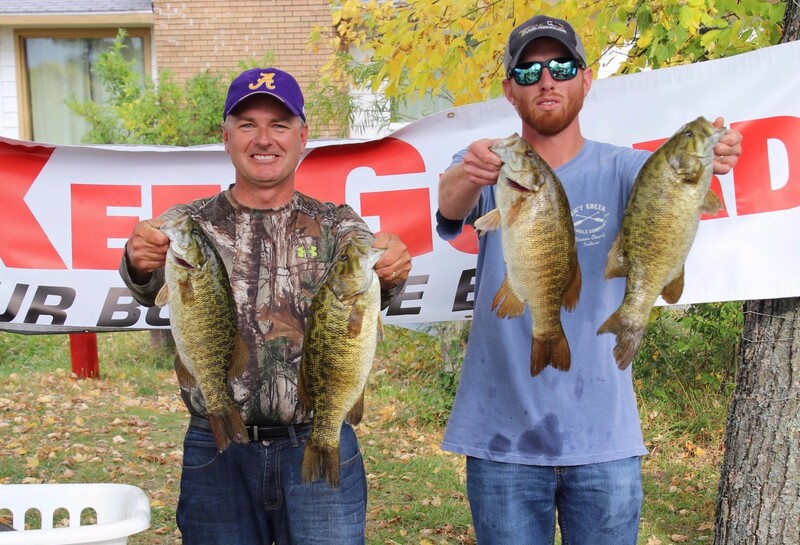 “We had a lot of confidence that our smallmouth would hold,” Selig said, “but that spot was also going to have a lot of wind on it come tournament time, so we wanted back up spots.” It is fair to say their search was successful. “We found a rock pile with scattered weeds the size of a car holding largemouth,” but they did not know exactly how sweet this spot was until late Saturday. 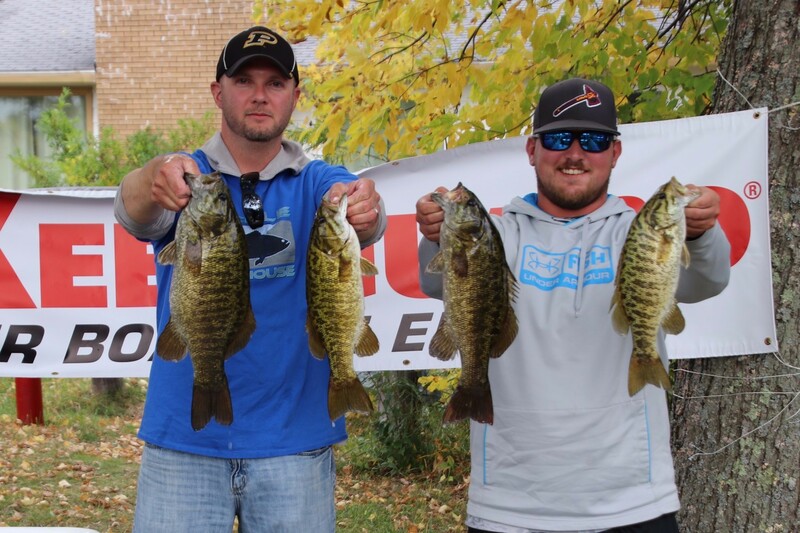 Until 1:30 during the tournament, the duo made multiple drifts through their smallmouth spot, which sat 3-5 feet deep and about a 100 yards long. They used a drift sock to slow the boat. It did not take long to catch a limit, but the bigger fish bit between 10:30-12:00. All 5 fish in the livewell were replaced during those 90 minutes. In all, this spot produced two limits of smallmouth. 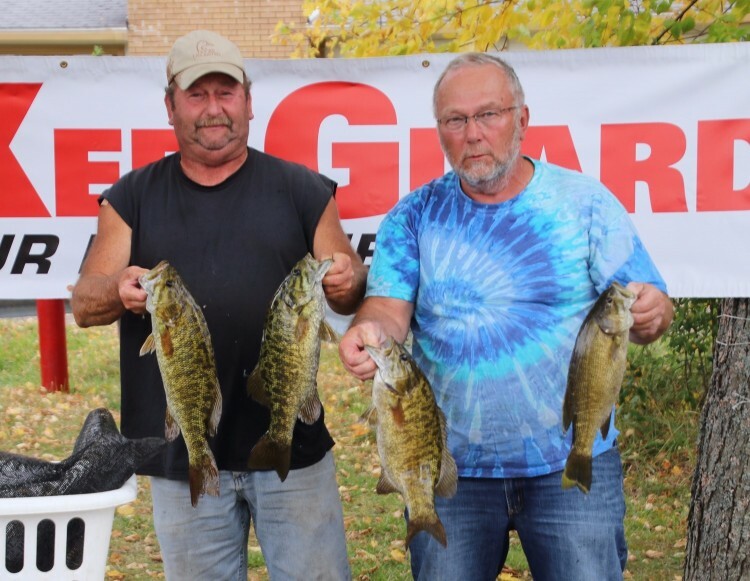 They rotated through two spots and landed 17 keepers, “We never went 30 minutes without a smallmouth bite,” admitted Wagner. Both spots were home to shell beds and were between 3-4 feet deep with sparse weeds. Quillen added several fish with homemade crankbaits. “Grinding them along the shells triggered some strikes.” The crankbait produced 3 of the 5 fish weighed. How it Happened: Three different spots produced two limits of fish. After spending considerable time in practice looking for deeper docks on the mainlake, they came across a sandy flat less than 2 feet deep holding smallmouth bass. 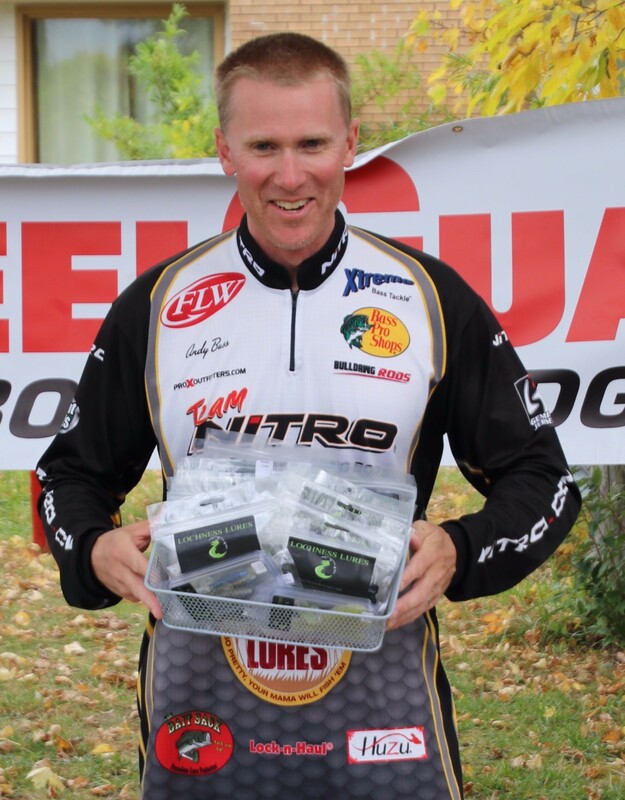 This is where they began the tournament, and it took just 15 minutes to have 4 in the livewell by slinging tubes. After overstaying their welcome, they ran to canals to target largemouth bass with weightless worms. They were able to cull 3 times. Their third stop was a breakline with a mixture of different vegetation 9 feet deep. By dragging tubes, they were able to cull 2 more times. How it Happened: The previous weekend the team led a 2-day tournament after 1 day on Houghton with nearly 15 pounds of largemouth, but when arriving Friday morning they were determined to find quality smallmouth bass. After scouring the flats they came across one spot that produced 3 quality fish on consecutive casts - their search was over. They began the tournament here and had a limit in just 40 minutes. The smallmouth were tricked by both chartreuse and red rattle traps. After culling one time, they left to find bigger largemouth by flipping jigs in thick weed beds. Unfortunately, they were never able to cull. 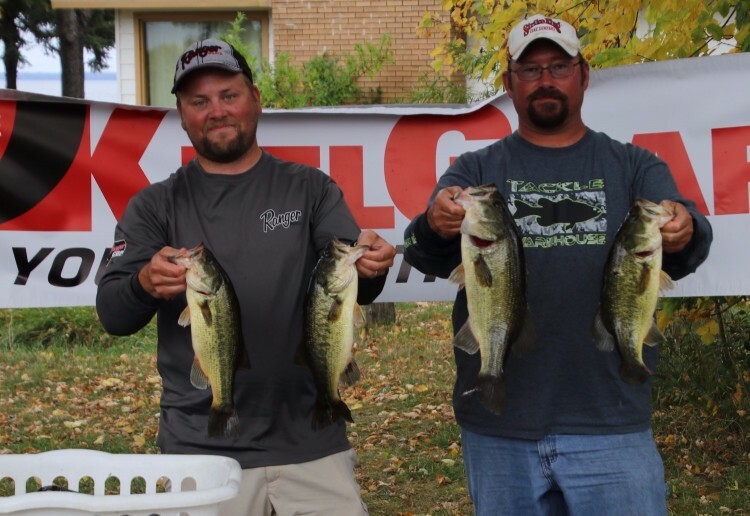 “We caught some 2 ½ pounders, but never one to cull,” Miller conceded. 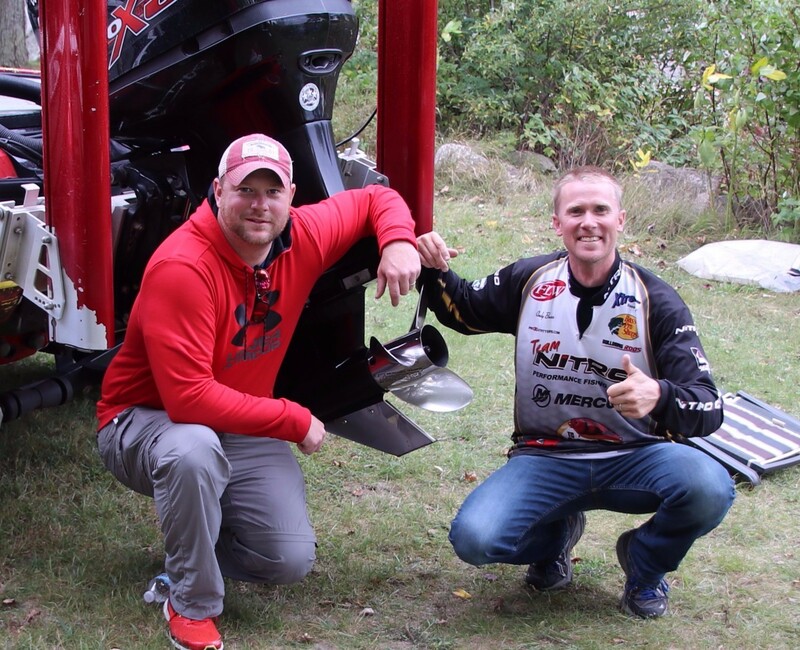 6th Place: The 2016 & 2017 East Season Champions, Mike Klavinski & Bear Griva, weighed 15.44 pounds and won $550. 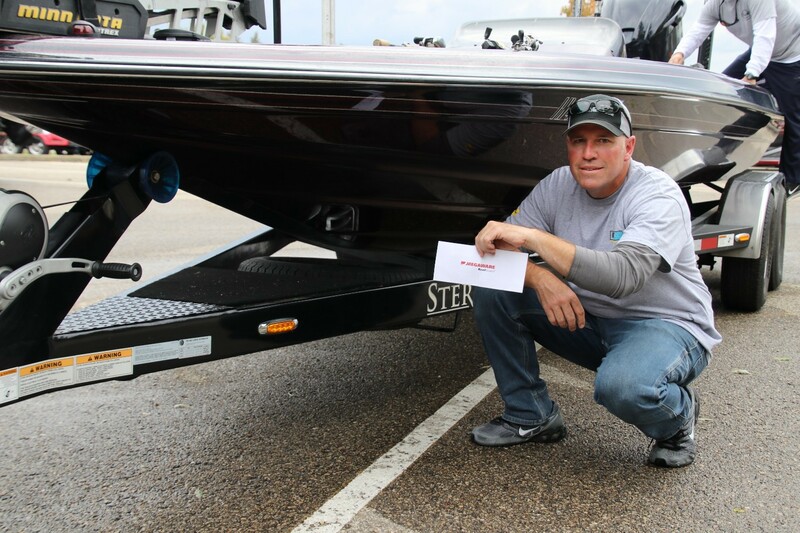 7th Place: Aaron Krider fished solo and still managed a 13.56 pound limit of smallmouth bass to pocket $450. 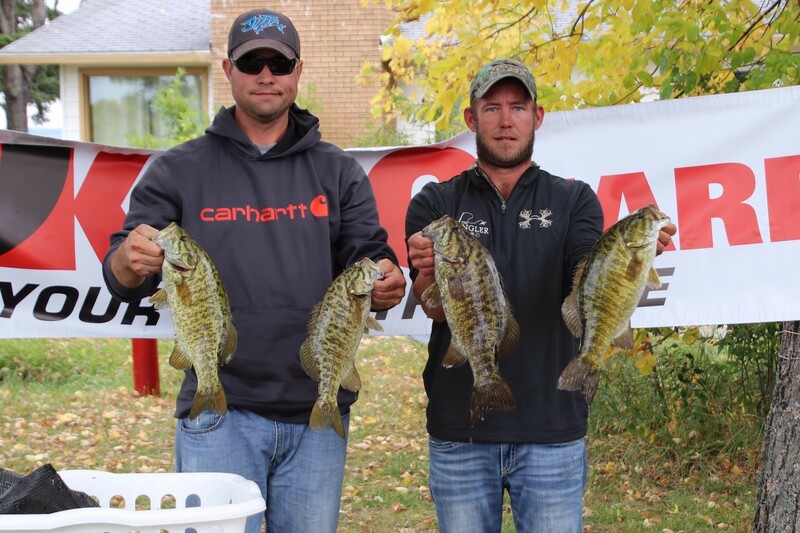 9th Place: A 13.21 pound limit of smallmouth won Matt Kiefer and Landon Baker $250. 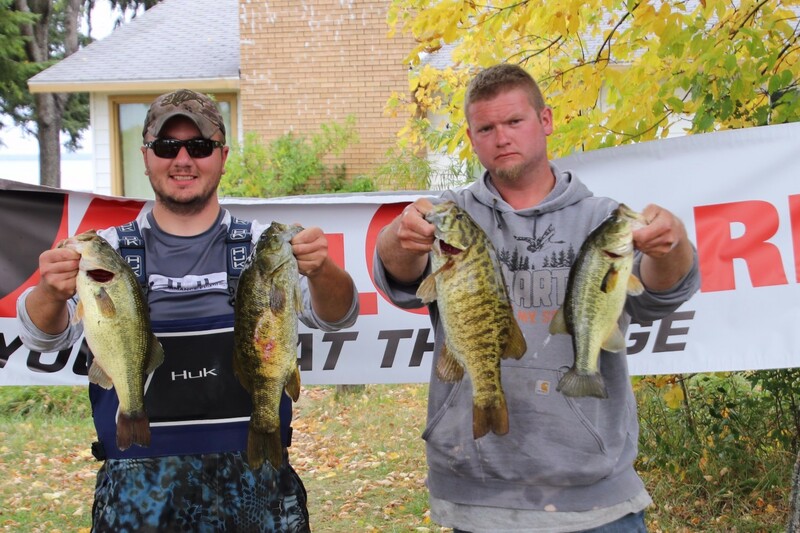 In addition, they also landed the second biggest bass of the day to win another $150, making their day worth $400. 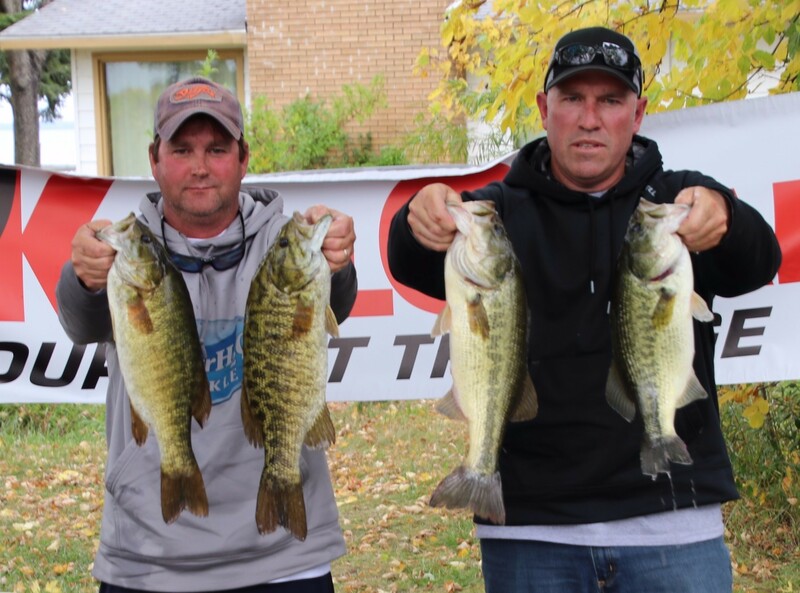 10th Place: A 13.04 pound limit awarded Duane Hartman and Mike Miller $200. 8th Place: 13.55 pounds of largemouth landed Lance Tresenriter and Chad Walter $350. 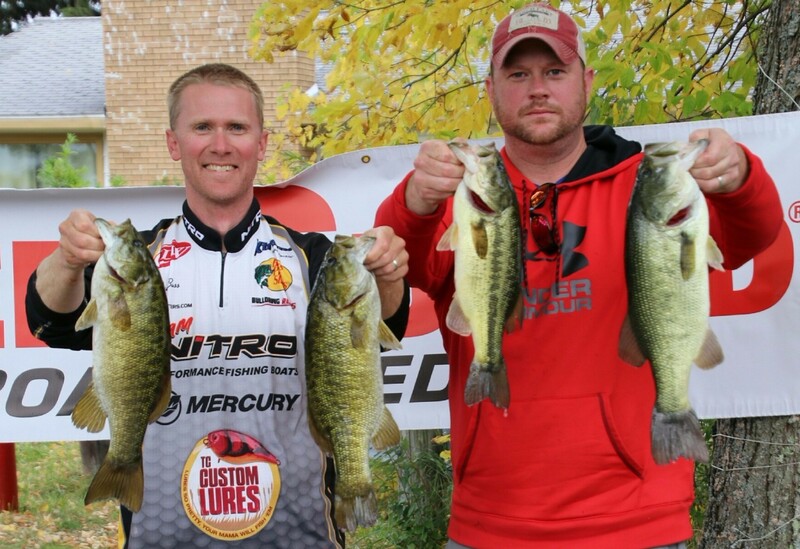 A 12.34 pound mixed bag of largemouth and smallmouth put Andy Buss & John DuPont in 11th Place. 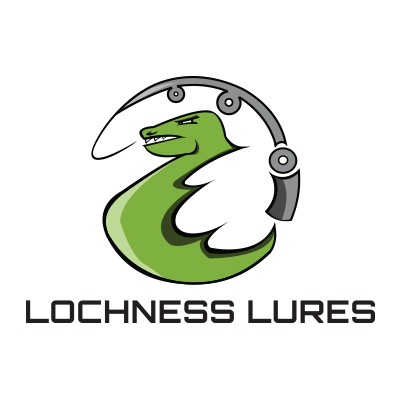 This won them $100 of product from Lochness Lures, but also put them top among teams with a Megaware SkegGuard and Megaware FlexStep Pro - worth $500, $250 a piece.